Wash the soaked chickpeas and put them in a food processor with the garlic, onion and spices. Grind until you get a rough moist texture. Add a little water if needed. Move the mixture into a large bowl, add the rest of the ingredients and put aside, covered, for 15 minutes. Warm the oil – it should be hot, not boiling. Add the baking soda to the mixture and knead a little. Wet your hands and shape little balls. Fry until you get a deep brown shade. Serve hot with pita bread, vegetable salad, pickles. 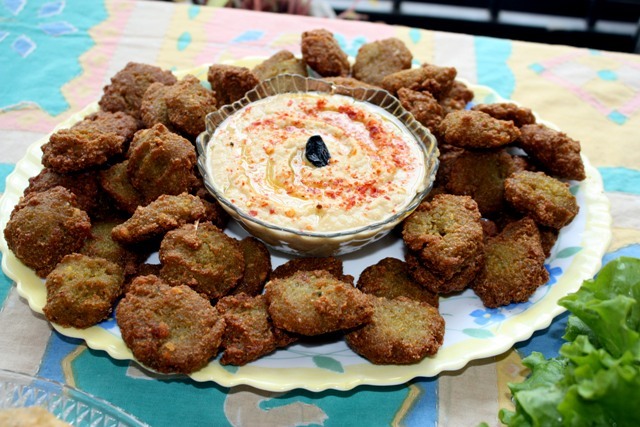 This entry was posted in Pulses & Beans, Vegetables and tagged Appetizers, Chickpea, falafel, Snacks by Kamakshi. Bookmark the permalink.